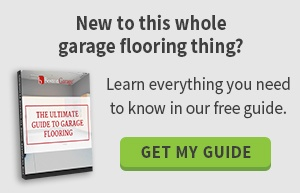 Garage floors are the most abused space in a home and are typically the most over looked. I find this silly as it is one of those spaces of a home that has the most potential, being as it has several uses. 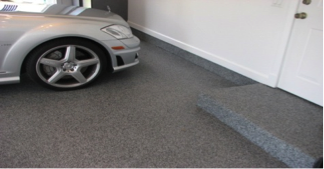 The biggest mistake that you can make with your garage floor is to ignore it. We often look at our garage floor that is stained, pitted or cracked and instantly think “paint”, after all it is a quick, inexpensive and easy fix, right? – Think again- paint peels, chips, and typically does not leave an even surface. You will find yourself painting the garage floor over and over making it a costly expense. Hire a professional! Another mistake in doing the garage floor coating yourself, whether it be paint or another product, chances are you will not have the proper tools and materials to properly prepare the floor. Proper preparation is huge! – It is the key to a successful, beautiful, safe and long lasting floor. Hire a professional as we use professional grade tools such as a diamond blade for the grinding process and professional grade material. With this being said, we offer a number of resinous polymer formulations of epoxy allowing us to address various temperature and climate conditions as well as concrete conditions. Ignoring a garage floor can be a safety concern. 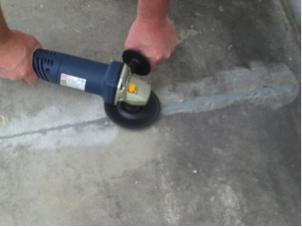 Concrete will eventually become pitted or cracked, this allows for harmful contaminants to seep in allowing for a dangerous environment and possibly an unpleasant odor(s). Wet concrete can be slippery causing a huge safety concern, however if it is coated with one of our epoxy coatings it becomes safer and the potential for slipping and falling is greatly reduced. In addition, we use a polymer filler that works well with our coating system and will restore the floor to a level , flat surface. We offer an array of styles, colors and designs to meet everyone’s personal taste whether you want a solid color or a decorative chip coating or a sleek, shiny floor or more of a grittier, matte look – our floors are showroom worthy. Don’t make the mistake of ignoring your garage floor. Hire a professional whom has highly trained employees with the proper, professional tools and materials. This will make your garage more aesthetically pleasing, functional and safe.